Garcia-Pelayo Spanish decided to focus all efforts to roulette after failing to become a successful record producer. His efforts bore fruit since he became the first person to exploit the wheel in the 1990s. Many people fronted the fact that the wheel was biased but had never succeeded in exploiting it. There are many stories relating to the wheel manipulation to give various results. This stories tried to explain just how imperfectly built the wheel was, the slightest of changes was believed to cause the imbalances that affected some results. He focused his efforts in Spain where he observed specific wheel spins many times and conducting data analysis using his computer. He employed the services of his 5 children to help record results. Before betting any money he had to make numerous observations. He would be able to change the odds to favor him by 15% over a house advantage of 5% by betting on the hot numbers. He would change casinos and repeat the process whenever pressure rose. He moved to United States and Las Vegas where he continued to rein after being discovered by all the casinos in Spain. After being discovered by all casinos in the world he retired with a 1.5 million dollar bank statement to show for it. Taft was a guru in electronics who had spent about 30 years of his productive years developing products that would be used to defeat casinos. Together with his son Marty he became amongst the first people to develop a computer that could capture digital video and microcomputer. 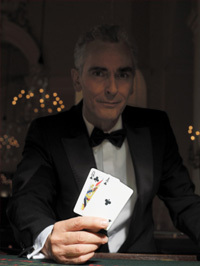 His drive was fueled after reading an article on blackjack by Edward Thorp which revealed that the game could be beaten by some mathematical formulas. He used his first computer called George to count cards; this machine was too heavy since he had to control it by using his toes. He developed a lighter model which helped him make $40K in the first week. He stabbed casinos in the back by selling and teaching people how to use his invention for $10k a piece. He was caught and later released because casinos and FBI could prove that he used the computer to cheat. The dual invented the "belly telly" which was a small video camera placed on the belt buckles to be used to see the dealers card. They would use this information to signal players on the best hits to make. They however did not stop there; they invented a computer that could tell card positions even after a perfect shuffle was done and a sequencing computer.